Why does it require someone lying on his or her “deathbed” in order for us to be willing to forgive, apologize or say, “I love you?” Can you imagine what your overall life and relationships would be like if you interacted with everyone as though it was the last encounter between you and them? Does the thought of putting this idea into practice sound a bit overwhelming? Well, fear not, kind readers, allow me to share what happened when I approached each relationship from the present moment for 24 hours. For an entire day I pledged to maintain a present moment focus with all of my relationships. As I formulated this plan after posting an article on New Year’s Eve, I meditated and visualized my heart opening. I made sure to add the caveat to my intention: “…and to forgive myself gently if I forget to stay present with any relationship.” After all, none of us is perfect. New Year. New day. It was the first day of the first month of 2015. Instead of a traditional “resolution” to get better in some area of my life that I lacked proficiency, I chose to explore deeper something that I already purposefully practiced: Being kind. How does one expand skills related to kindness you might wonder? It turns out that the answer is yet again as I’ve mentioned in past posts: Simple but not easy. Isn’t it perfectly peculiar that no matter what aspect of kindness we dissect, the approach to practicing it is the same? It always boils down to relinquishing complexity. What I mean by “complexity” is any thought you choose that does not require you to first let go of any investment in a specific outcome unfolding. Sauntering out of bed as the first rays of sunlight pierced the bedroom curtains on New Year’s Day, I hazily recalled my mindful choice the night prior. The first test for my “resolution” was greeting my father, whose house I was staying at for the holidays. Seeing my Dad working diligently, seemingly unaware of my presence in the room, even though it was barely morning, I realized the temptation to stray from the “now” and wander into the past or future. There were many days of my childhood where I walked into a similar scene: my father working with laser focus, barely looking up from his tasks to see me standing next to him. Rather than bringing that past experience of feeling dismissed into my present, I closed my eyes, took a deep breath and let go of needing to feel distant from my Dad. Instead, I looked upon him with kindness. Smiling warmly, I threw my arms around him and wished him “Happy New Year!” Sensing my genuine desire to connect, my Dad softened his attention and returned the embrace, grinning the whole time. The slight pivot of choosing a mindset of kindness was the catalyst to a fantastic day with my family. Each time I was aware of feeling tempted to step back into the “past” or “forward” into the future emotionally, I stayed rooted physically and psychologically into the present moment. Whether it was attending a family brunch, meeting new people at a neighbor’s New Year’s Day party, or just passing someone on the street, I approached each interaction with kindness and did not attempt to manage the interpersonal exchange to ensure a specific outcome unfolding. The biggest take-away for me: How much happier and at ease I felt. Seeing through the eyes of kindness prompted kindness to become my default more times than not. Each time I chose to be kind and to therefore be present, I felt less tension and urgency to control how things transpired. The beauty of this approach is that you can universally apply it. You can test it out at the workplace, in your personal life and of course, with yourself. Kindness is meeting someone where he or she is at in the present moment and that definitely includes extending that same grace to your inner self. Of course there were instants of brief mindlessness during my 24-hour trial. For example, I did falter once. I took offense to someone absconding the last frosted holiday cookie from the brunch spread, even though she had already indulged in a plateful, but my desire to feel slighted did not last long and I forgave myself for the slip. As you’ll recall from the beginning of this post, none of us is perfect and that definitely applies to being mindful about being mindfully kind. The overall experience and effects from a single day compelled me to continue the practice each day after. Some days are tougher than others: The Covered California hotline, COSTCO, or “perfectionist” family members all posed colorful challenges. However, as long as I remembered to gently forgive myself when I strayed from the present moment, I usually returned to viewing life through my filter of kindness rather quickly. In 2015, let’s all resolve to do our best to become more aware of opportunities to practice kindness and to forgive ourselves when we forget. Your relationships will define your legacy. What better one could there be than one forged upon being kind? 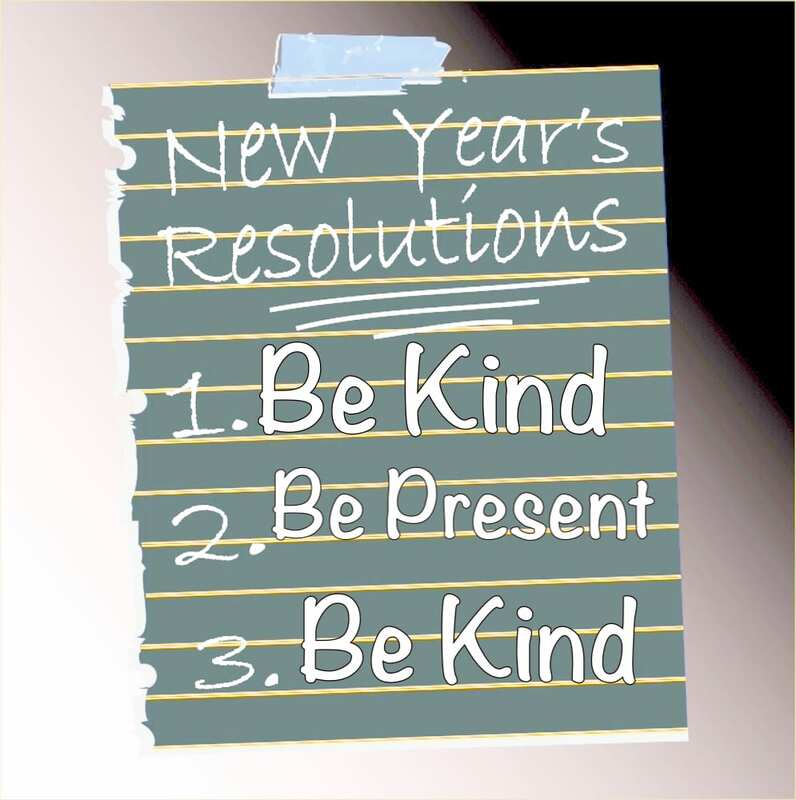 Will you join me in 2015 and do your best to stay present and to pivot towards a mindset of kindness with all of your relationships? Are you willing to begin today? Let’s use 2015 as the catalyst to join with me on the lifelong journey and desire to leave a legacy of kindness. I’d love to hear from you.